Makita is at it again, making tools smaller and lighter, but still giving us the power we need to get the job done right. Their new GA4534 4-1/2" angle grinder packs 6 Amps of power into a barrel that is only 2-3/16" in diameter. This Makita built motor delivers 11,000 RPM's and uses labyrinth construction to seal and protect the motor and bearings from dust and debris. "The new GA4534 has the smallest barrel grip on the market, and is the most compact and lightweight paddle switch angle grinder in its class," said Wayne Hart, Makita communications manager. "Makita has shown once again how to take an industry leading tool and refine it to make it even better." In addition to the smaller size and the weight(only 4.2 lbs.) 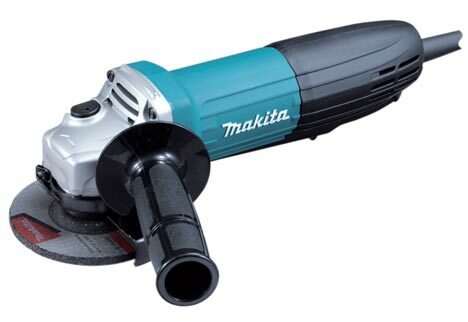 of the GA4534, Makita also positioned the side handle of the grinder at an increased angle of 20-degrees. This simple angle change actually does feel more comfortable. If you don't believe me, pretend like you are holding a grinder in your hands, than move your side handle hand 20 degrees out. Simple things.